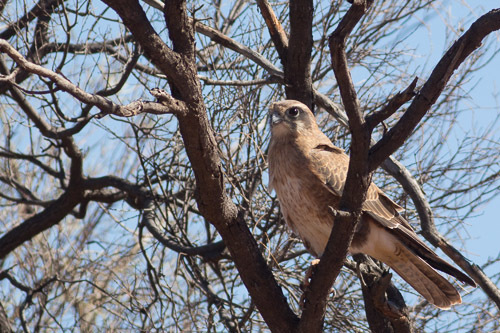 Just after I filled up with petrol at Kulgera, I spotted a Brown Falcon sitting in a tree right by the road. So I had to stop and photograph him through the window of the car. It is funny how they let you photograph them from inside the car but as soon as you get out, they fly away. Desert Oaks Rest Area was a great place to stay. Plenty of shade and plenty of room. The Northern Territory has heaps better rest areas than South Australia. The rest areas from Port Augusta on the Stuart Highway on the South Australian side are disgraceful. 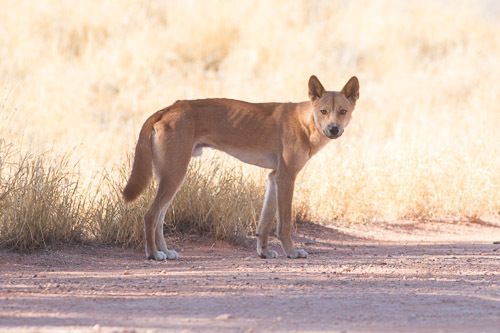 In the morning I saw this Dingo near the road. It was the first one I had seen in the wild. 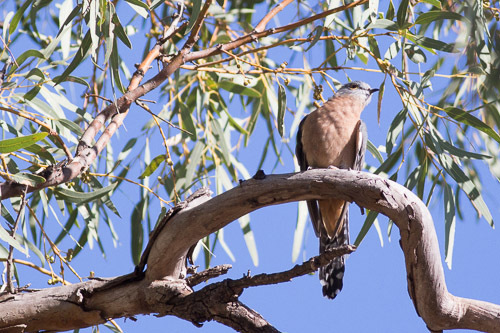 Finke River is an ancient river – millions of years old. It occasionally has water in it. I have no idea when. It is so dry in the center. 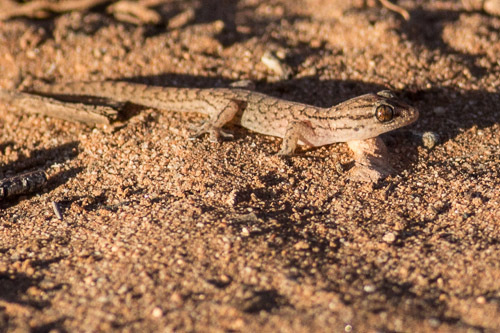 Gecko – Eastern tree dtella ? 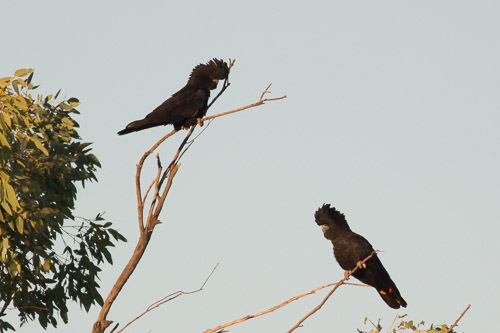 These Red-tailed Black-cockatoo were on the other side of the bridge. Mount Polhill is last rest area before Alice Springs. About sixty kilometers south of Alice Springs. It is a very tiny little area that is full up tonight. 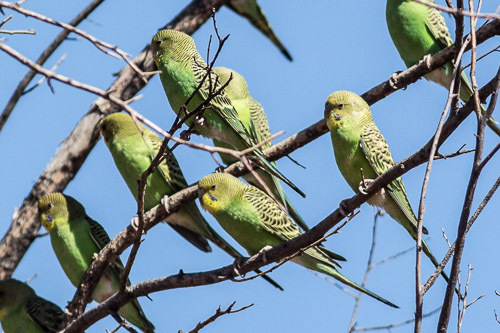 First sight of Budgerigars here. There are big flocks of them flying around willy-nilly like they are crazy. 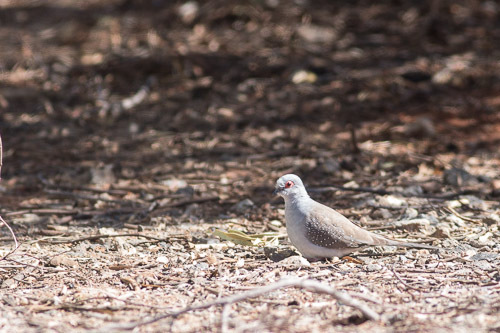 This Diamond Dove wanted a drink at the water tank. Heading north from Marla in South Australia, you start to get a few dry creeks with eucalypts in the sandy bottoms. 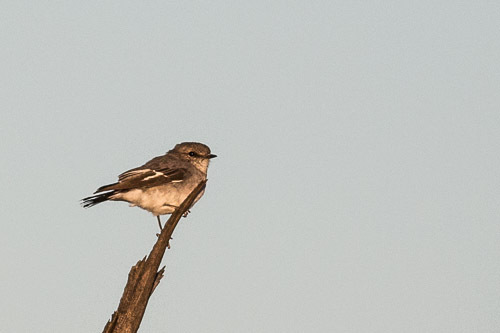 First one was the Indulkana creek but it was the middle of the day and very hot so nothing much about just Singing Honeyeater and Willy Wagtail. I camped at Tarcoonyinna creek which is about 60k north of marla. There were lots of raptor nests in creek trees. 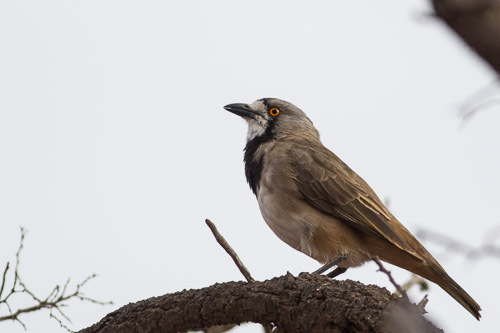 In the morning I spotted a whole heap of birds near the road as I was driving out. 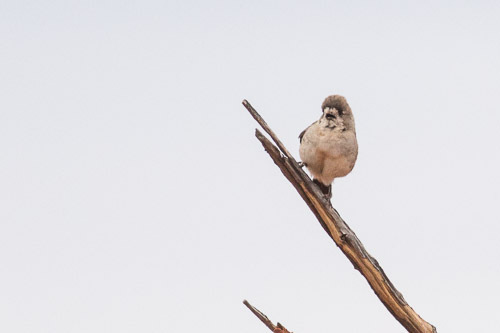 I thought these were Chestnut-breasted but it was just the reflection of the red dirt on their white chests. doh! 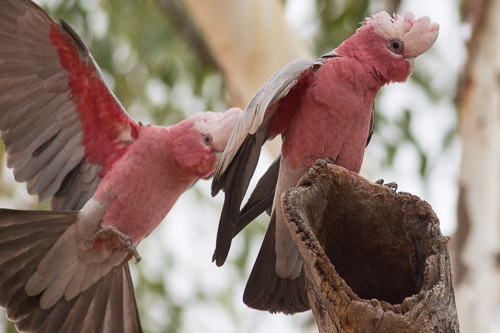 I had not really noticed the crests on these Galahs before but they are quite striking. I am not sure what this is. 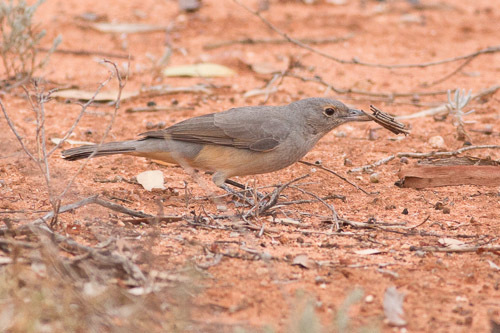 Probably a female Rufous Whistler or a Grey Shrike-thrush. I dunno. 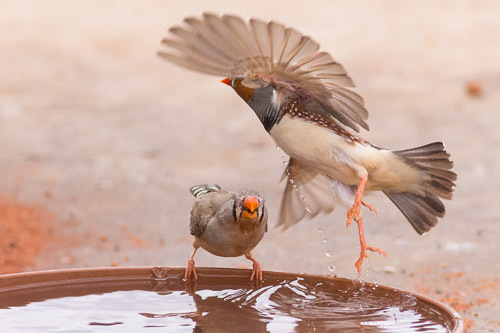 At the Northern Territory border there were lots of Zebra Finch hanging around the water tank. 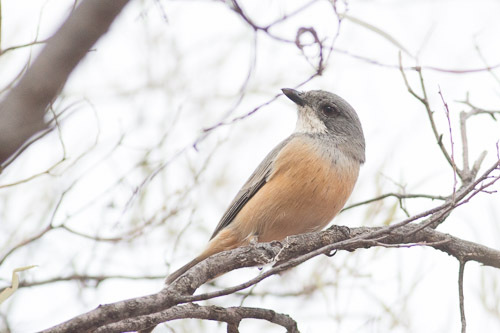 This male Rufous Whistler is pretty much all I saw on a late afternoon walk along the border. The first stop coming north from Coober Pedy was Poutnoura. 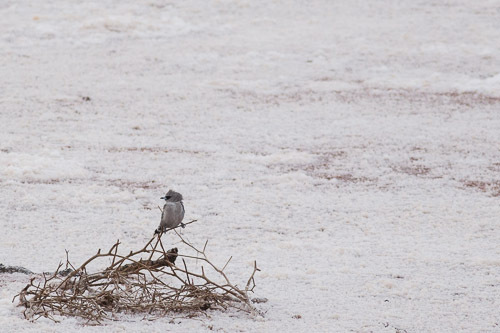 I went across the road to the train line and found a few Hooded Robin. 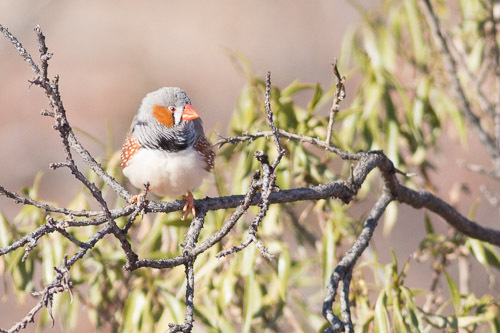 And there is starting to get a few Zebra Finch. Later they will be everywhere the further north I go. Then another tick with the Redthroat. 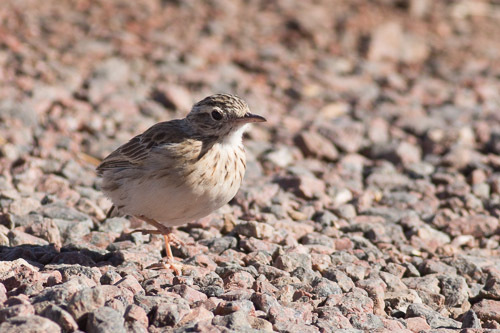 Just before I left, an Australian Pipit threw itself in front of my lens so I had to take its photo. It was just right there in front of my car, stopping me from going anywhere. I stopped at the caravan park at Marla for a night. Right next to the truck stop. What a nightmare. It is not so nice trying to sleep with a truck motor going off in your ear! 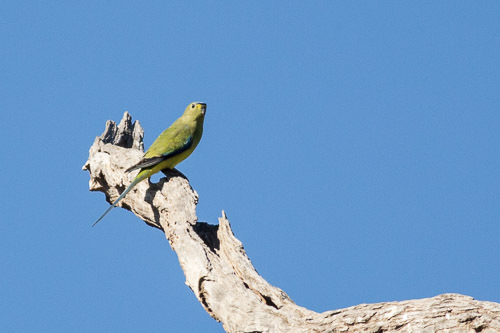 But I finally saw the zonarius race of the Australian Ringneck. 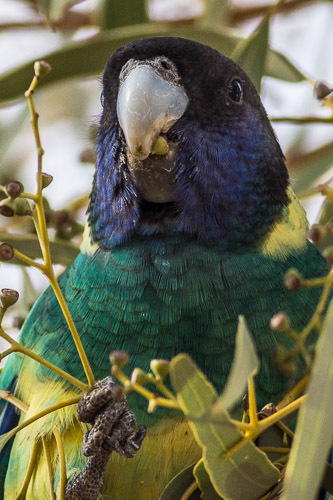 They were eating some of the gumnuts in the caravan park. 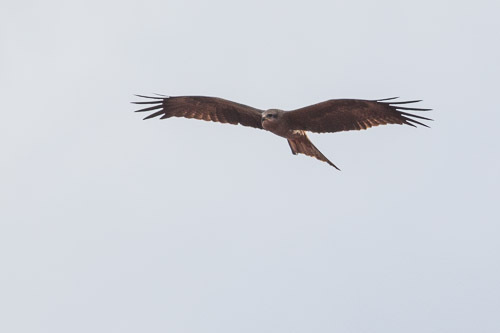 I finally got some decent shots of the Black Kite. 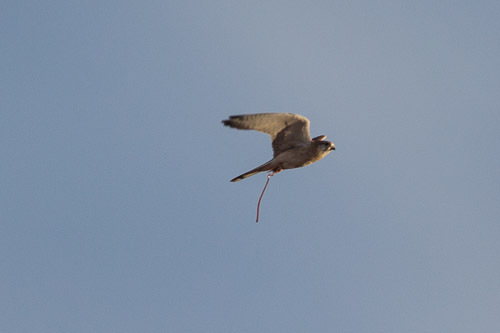 And this Nankeen Kestrel came flying past with a little snake or something. 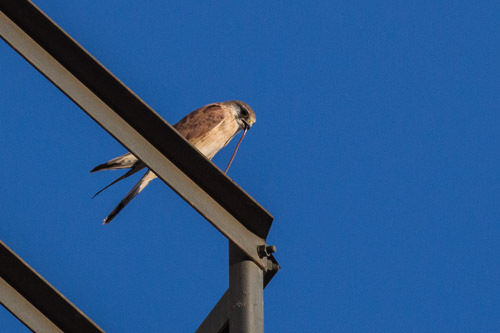 And landed on a water tower and proceeded to eat it. The Breakaways and Dingo Fence. 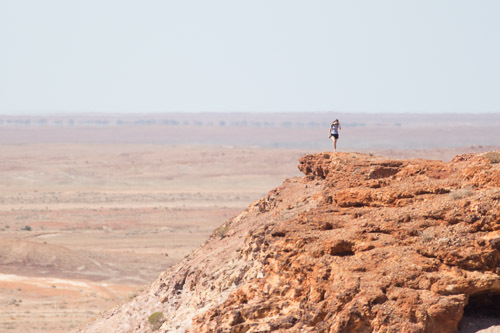 I did a few walks around the memorial, about ten kilometers south of Coober Pedy. 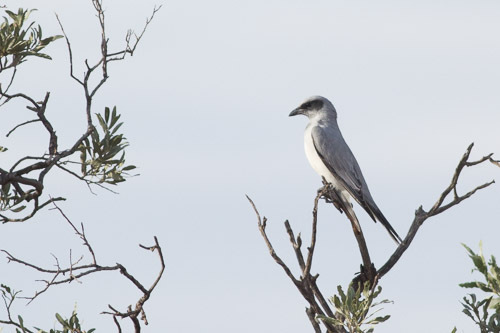 I never saw very much, just a mob of Zebra Finch, a few White-winged Fairy-wren, and a couple of mangy crows. And I walked for miles and miles and had a really good look. I went for a drive to The Breakaways, which is a bunch of mesas sticking up out of the desert. Sea levels were much higher 150 million years ago. As warmer climates unlock frozen water from the poles, so much of Central Australia lay under a vast inland sea. Much of the area is mudstone with a cap of harder rock. Sections of this are eroded and the softer mudstone is eroded leaving sections still sticking up out of the plains protected by their harder cap-rocks. 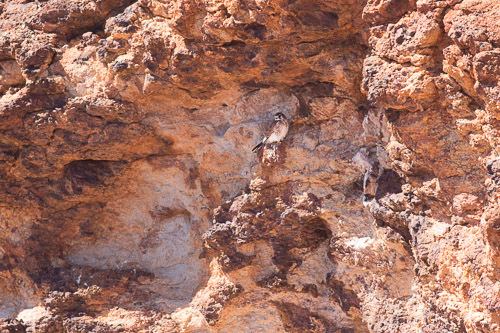 I found this Nankeen Kestrel sheltering in the lee shade of a mesa top. It was not going out in that hot mid-day sun. Looking out on the plain to a distant mesa. And a panoramic shot of the landscape. Here is a typical mesa showing the hard cap-rock holding it all together. 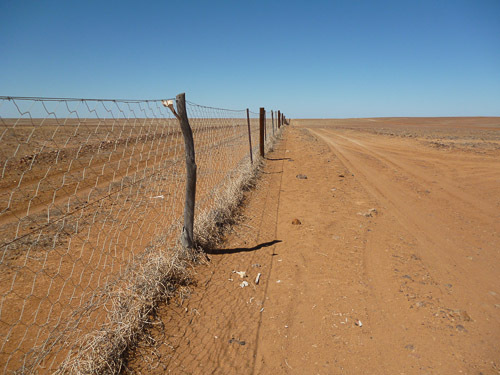 Further past the Breakaways was the dingo fence, which stretches for 5000 kilometers from Queensland to South Australia. It is supposed to keep the dingos out, to stop them eating all the sheep. Back in town, I went to the Umoona Opal place which was underground. 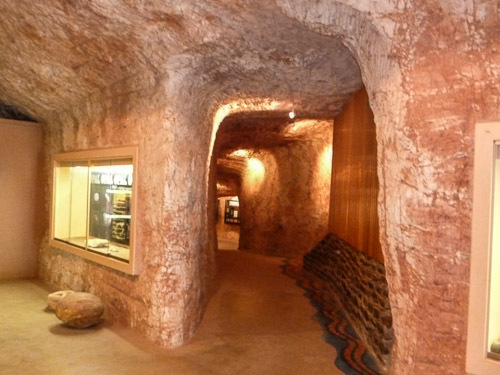 A lot of homes in Coober Pedy have been built underground, which is a great idea, keeping the temperature constantly around 25 degrees Celsius. 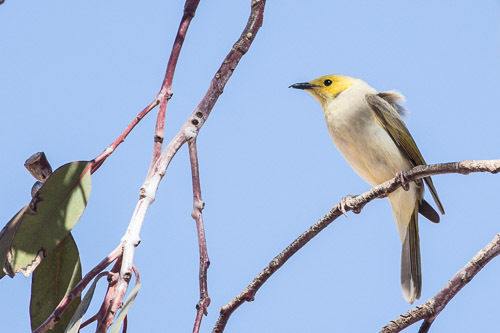 There were a bunch of White-plumed Honeyeaters up the lookout near the Big Winch making a hell of a racket. 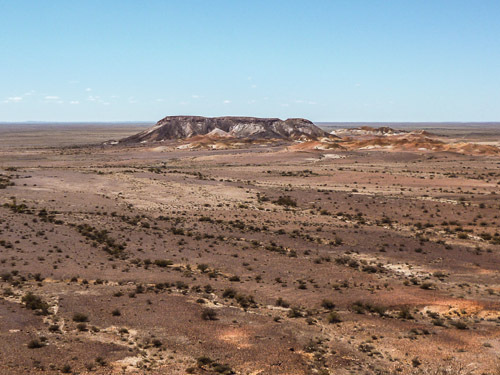 And last but not least a panoramic view of the town of Coober Pedy. The red centre is beautiful. Luscious shades of red and green. I never expected it to be this amazing. I am just blown away by the sheer awesomeness of the landscape out here in the outback. Today it rained. Not much, just a little. I never thought I would feel rain out here. 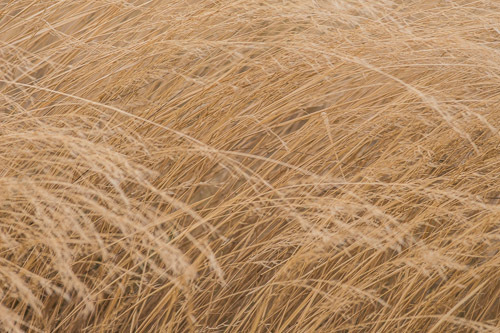 And it is so flat at times – just nothing but gibbers and small bushes for hundreds of kilometers. Mulga Wells in the morning gave me a mob of Blue Bonnets. 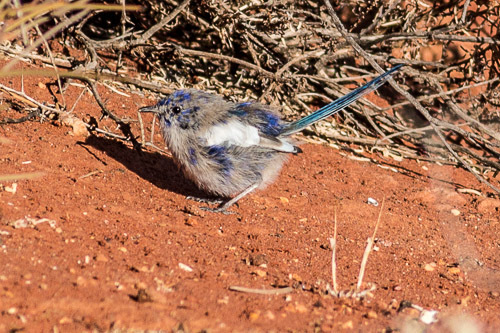 This male eclipse White-winged Fairy-wren was in some very dry gibber country. i had crossed over the road and found this scrawny male and a few females. 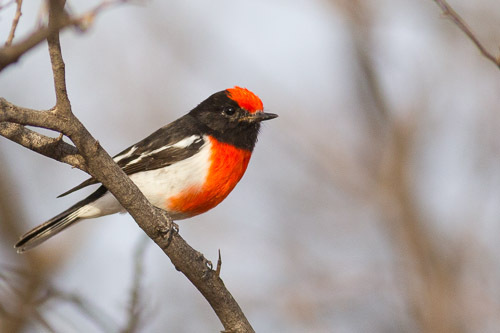 As well as a few Red-capped Robins. 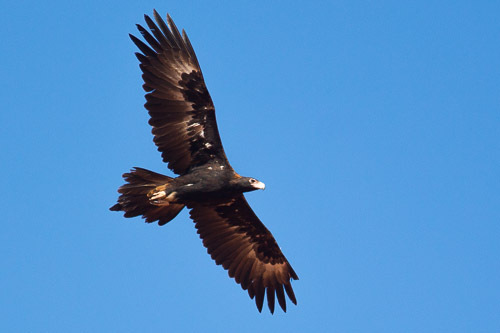 I saw this eagle over the road from the Mulga Wells North rest area, so I crept up on him. He takes off and circles me for a few times, having a good look at me and then takes off. Meanwhile, I have some great photos of a truly magnificent bird. 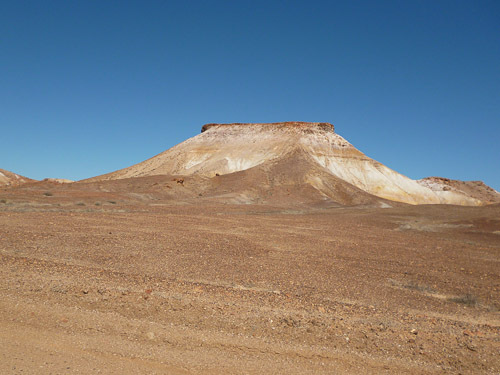 150 kilometers south of Coober Pedy, bon bon station. There are lots of little pebbles that look like iron ore, same colour. There are so many flies. ugh. 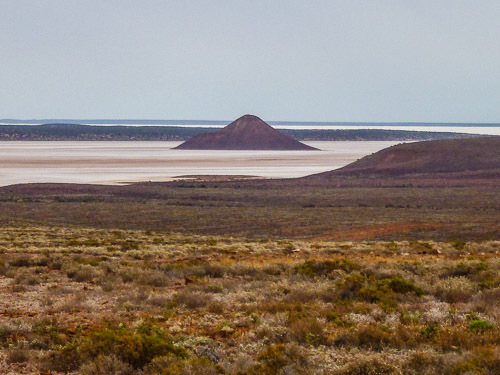 I kept wondering about the salt lakes that I was encountering as I went deeper north into outback South Australia. I could not work out where the salt came from because I was thousands of kilometers from the ocean. But I read that this area used to be an ocean millions of years ago and the sea levels lowered and left these salt lakes, which then evaporated. 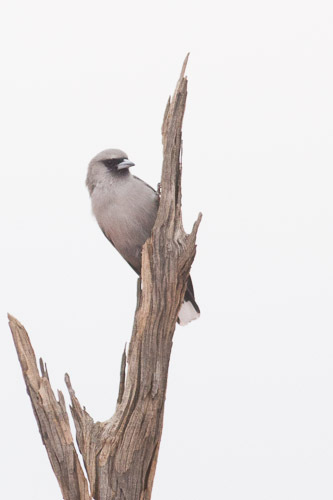 I finally got some decent shots of Black-faced Woodswallows. There were quite a few of them around Lake Hart. 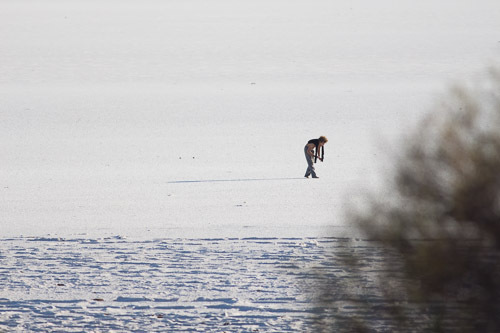 In the late afternoon some of them ventured out onto the salt pan. 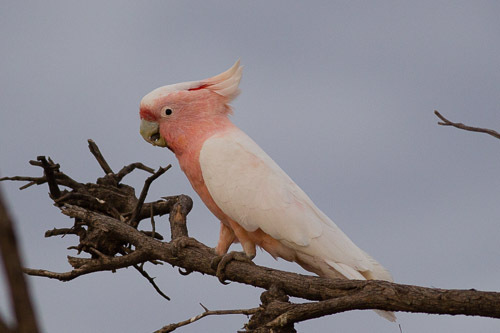 And I also got some good shots of Major Mitchell’s Cockatoos. I had only got some average shots before so I am quite relieved to finally get something decent of them. They were feasting on these native melons. In the morning I went back along the lake shore. This man was collecting salt. 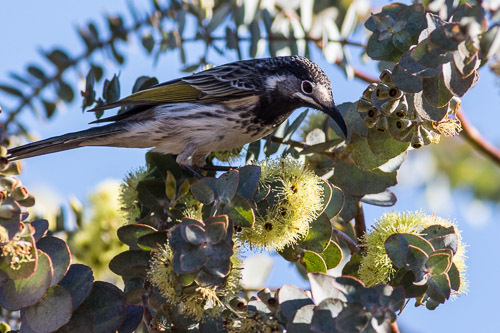 This Yellow-throated Miner was feasting on some young mistletoe flowers. They were still green and when older go a rich red colour. 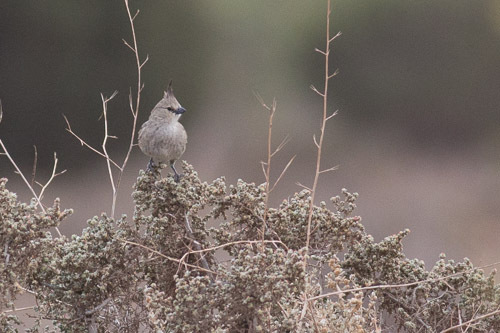 I thought these might be Ground Cuckoo-shrike but imagine my disappointment when they turned out to be of the White-bellied variety. From my book, it says they are out of range here. And a nice desert flower. Quite a beautiful flower. 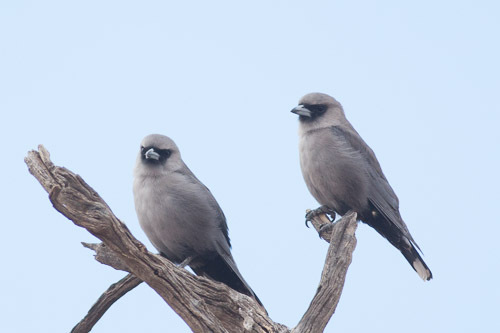 And to end the day off, some more Black-faced Woodswallows. Leaving Port Augusta, I stopped 30 kilometers north. 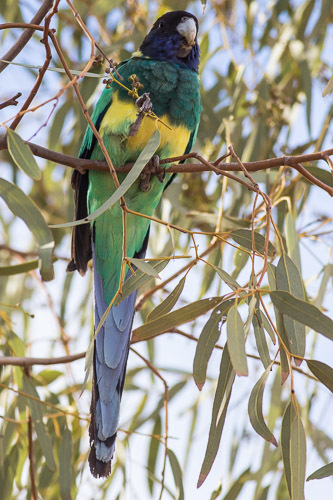 I was not expecting much but was stunned as a pair of Mulga Parrot roosted near my camp and started munching on some bushes. 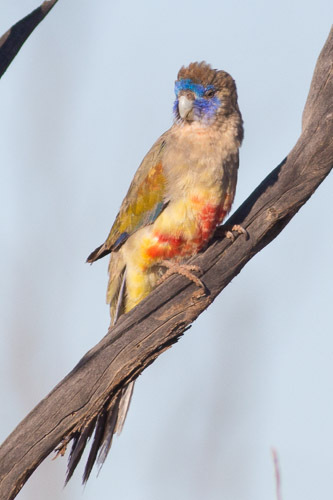 The female is a lot duller than the male, with a red patch on the wings. 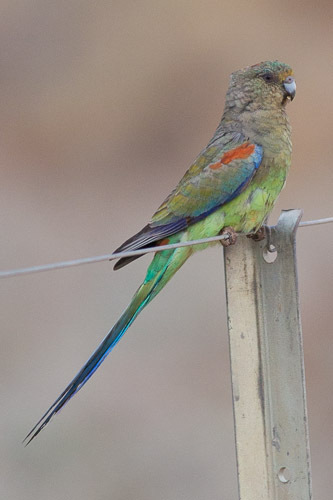 The male Mulga Parrot had a yellow patch on the wings with a yellow and red belly. In the morning I went over the other side of the train line because I could hear a few birds over there. 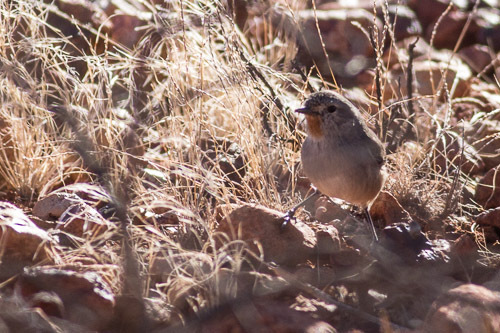 This immature Red-capped Robin sat up posing for me quite nicely. 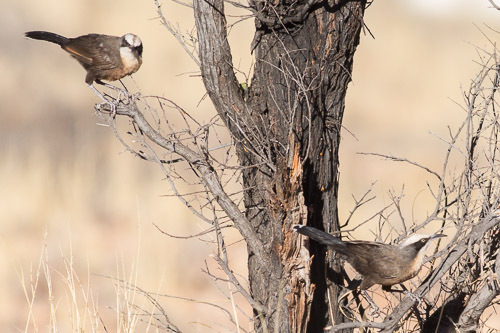 I was quite surprised to find a couple of Crested Bellbirds. They were not real shy and allowed me to get reasonably close for some good photos. The only other time I have seen them was at Cunnamulla in Queensland, years ago. This area is a wide gibber plain with a light cover of chenpods. 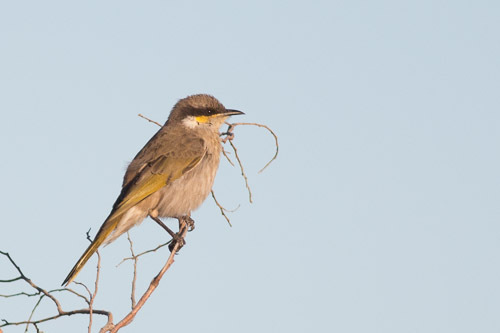 There are Western Myall (Acacia papyrocarpa) woodlands interspersed. 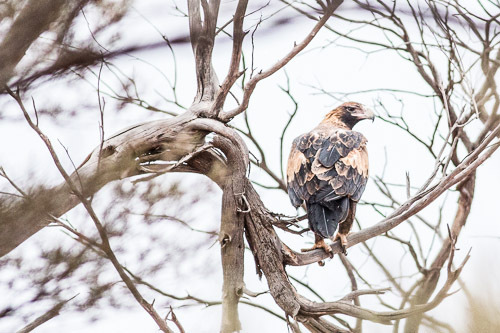 Later in the afternoon I spied an eagle in a tree after he had flown off from a kangaroo on the side of the road. Back again last night and this morning to the Australian Arid Lands Botanic Garden at Port Augusta. 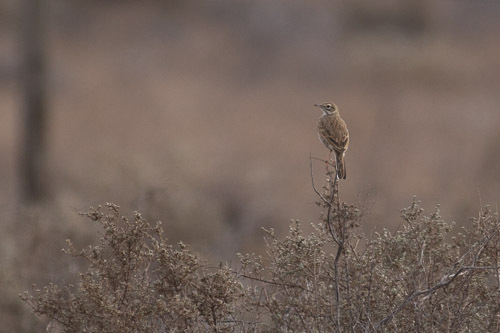 The weather had turned overcast in the afternoon, so there were not so many birds around. 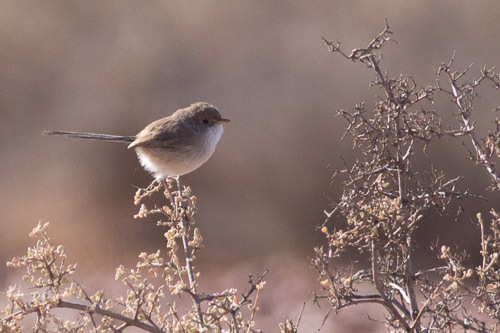 I did happen to photograph a White-winged Fairy-wren but it was so far away, it was pretty much out of focus and not usable. This morning was still overcast so it was a little bit quiet again. 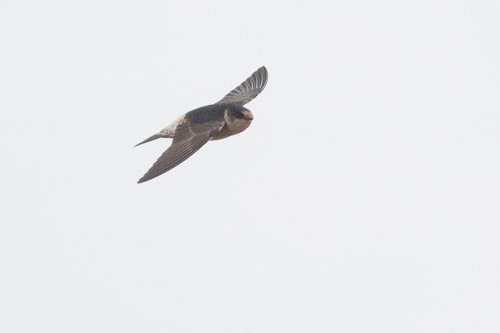 There were heaps of Tree Martins scooting around in the skies above me, as well as a few Welcome Swallows. I was fascinated by all the botanic exhibits and realized I know next to nothing about plants. 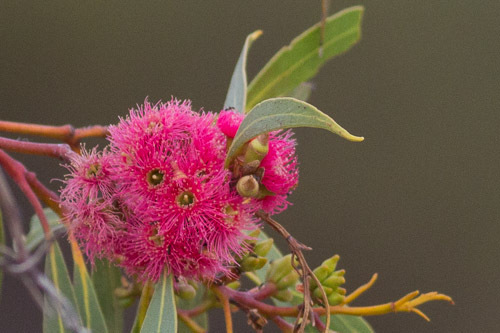 There are about 100 different species of mallee tree/bush! 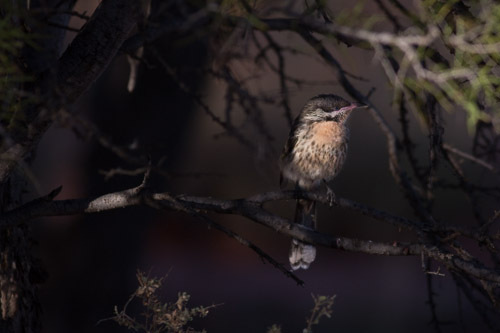 I saw tthe Chirruping Wedgebill again. 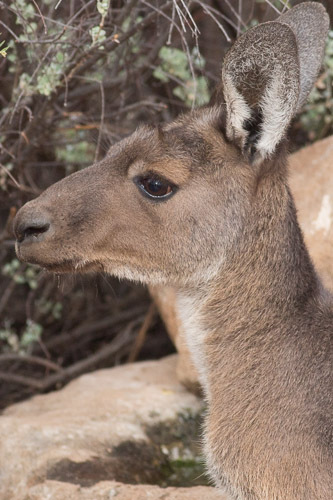 This kangaroo was having a drink near the hide. 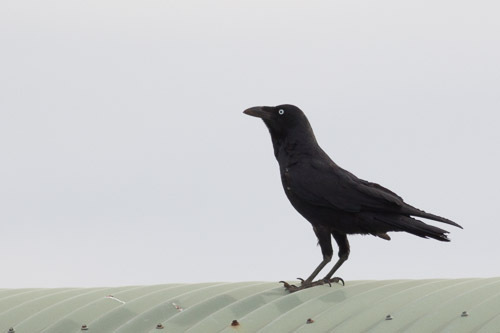 I think this might be a Little Raven but I have no idea. The only thing I am going on is the range and the small hackles on the throat. The pipit formerly known as Richard. 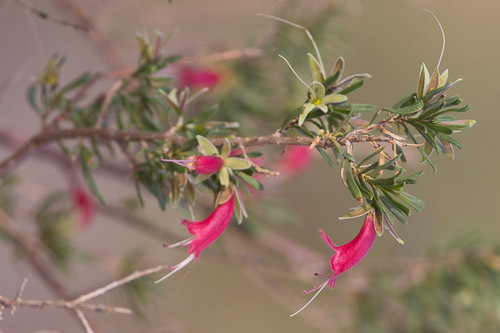 “Grab your hat and a bottle of water and head off on one of our scenic Garden Walks.” The Arid Lands Botanic Garden is a couple of kilometers north of Port Augusta at the head of Spencer Gulf in South Australia. It really is a remarkable park and well worth a visit if you are heading this way. 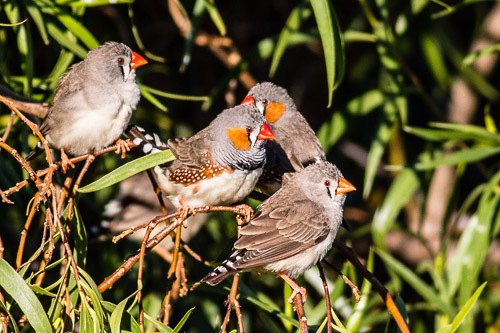 This morning these Zebra Finch were just in front of the visitors centre enjoying the early sun. 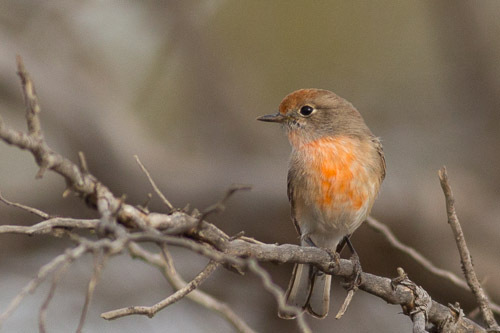 The males have the orange cheek and the females do without. 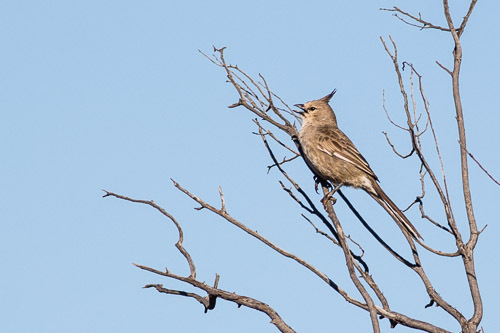 I was stoked to get a photo of the Chirruping Wedgebill. It is a tick for me and is endemic to this area. And another tick with this one. 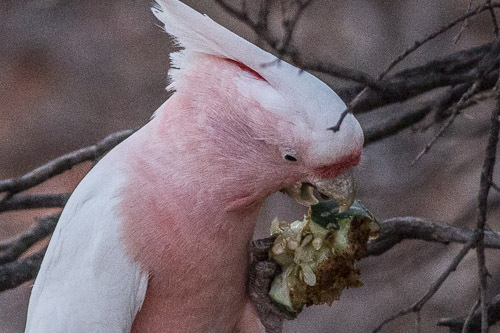 He is having a feast on the Book Leaf Mallee (Eucalyptus Kruseana). They have a distinctive red dot just behind the eye. 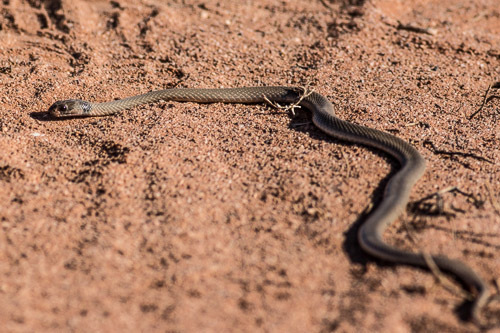 This little snake crawled across the track right in front of me. I have no idea if it is venomous or not but I suspect it might be. Port Pirie to Port Augusta. I left the fabulous library at Port Pirie and drove north a few kilometers and stayed the night at Nukunu Rest Area. 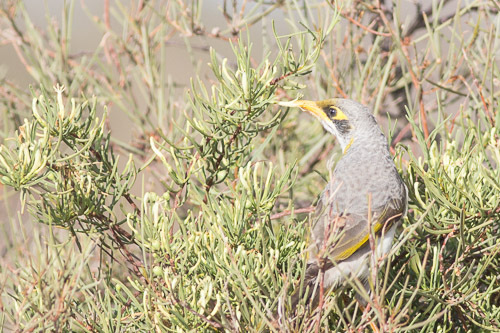 There was some good bush along the highway and I seen some Singing Honeyeater (Lichenostomus virescens), Crested Pigeons and a mob of White-browed Babblers. 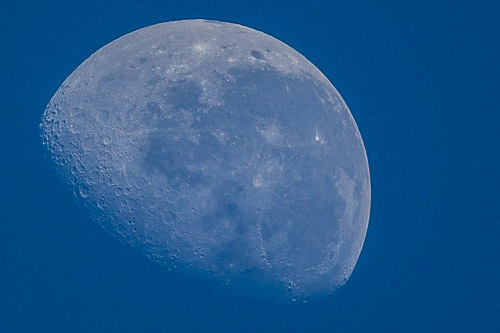 The moon was still up in the morning, nice and clear. 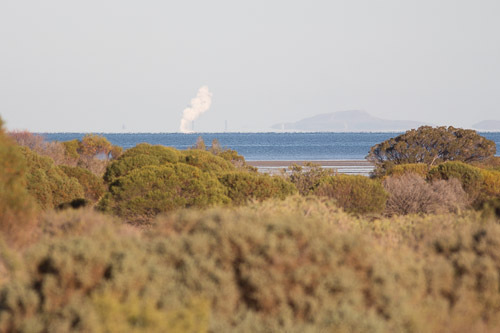 Mambray Creek is 50 kilometers south of Port Augusta. I stopped at the rest area and walked along the road going to the gulf opposite the turn-off to Mount Remarkable National Park , which is 5k up the hill. 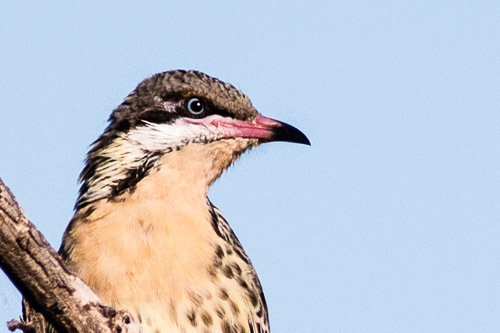 This photo above shows why this bird got its name. 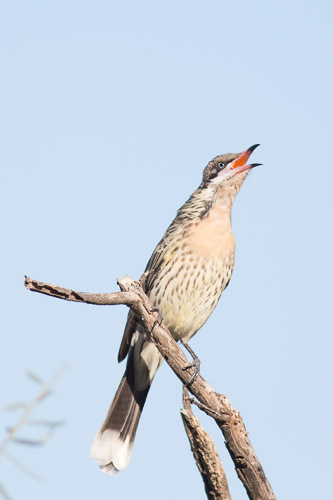 And here is the Spiny-cheeked Honeyeater in full song. A very nice singer indeed. 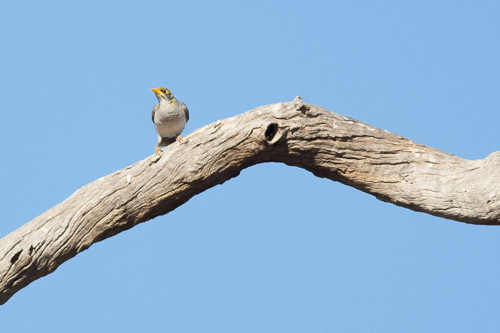 There were heaps of Yellow-throated Miners hawking in the big old gum trees. 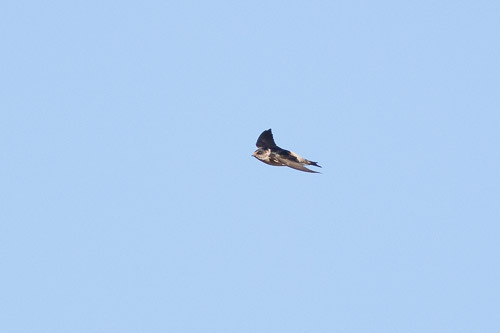 And a bunch of Tree Martins hawking around. There was a wide variety of birds along this short stretch of road. 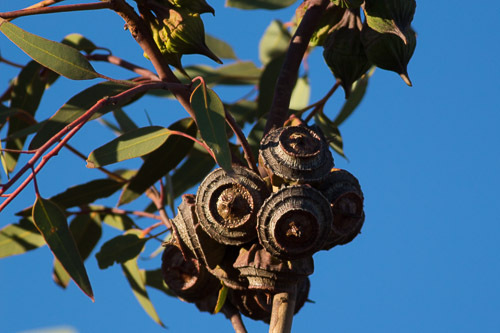 The old hollowed out gum trees might have had something to do with it. 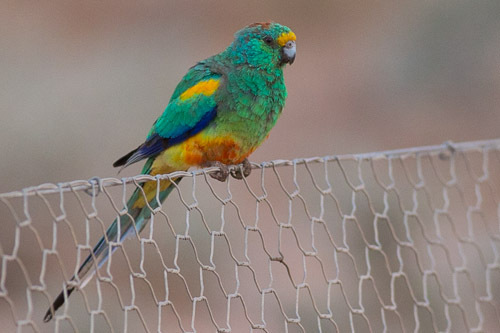 Last but not least, the magnificent Blue-winged Parrot. I think this is the first time I have seen one of these. tick tick.